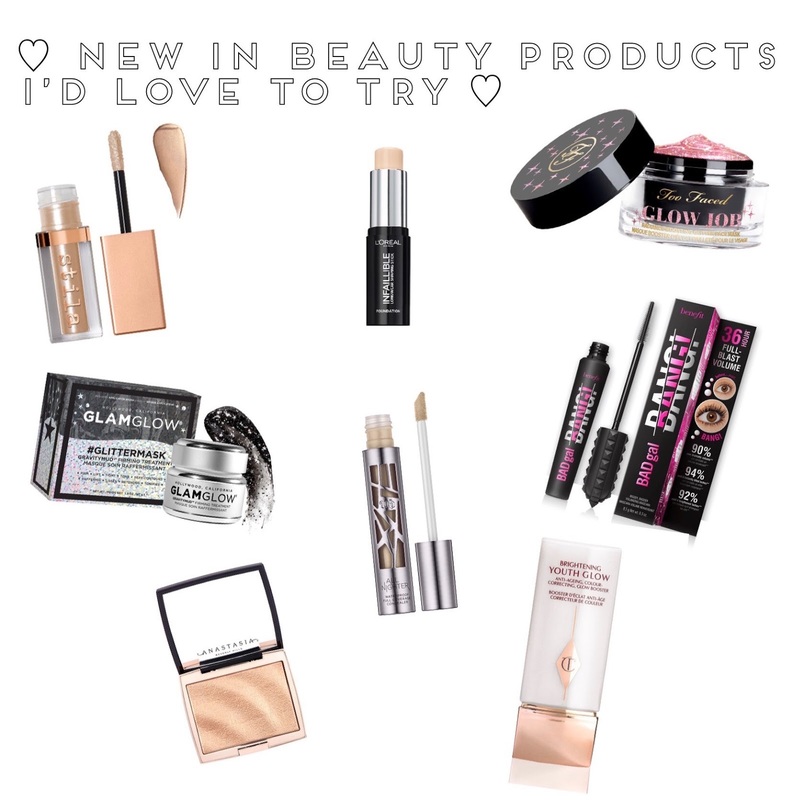 l Recently new in beauty is really upping their game - brands are bringing out so many products that look amazing and I’m so intrigued to try! Between drugstores and high end, so much Is happening Beauty youtubers & bloggers have been posting all about these new and amazing products and it just makes me wanna try them even more - seeing the good reviews and praise surrounded these product. Some of these I haven’t even heard of untill I saw advertise on Instagram. My bank really doesn’t appreciate this but all I wanna do is go shopping - shop for makeup and skincare! To start with, the product I probably want the most has to be the Anastasia x amrezy Highlighter! From the swatches this lacks no pigment, glows to the gods and has the most gorgeous packaging! What’s not to love? Next has to be the new benefit mascara! Personally I think they put wayyyyy too much hype behind just a mascara but I can’t deny it does look amazing - from the photos and reviews I really want to try it! Update - I have got ahold of this!! One product everyone hypes is over the stila Magnificent metals I really wanted to get on the hype but I never saw any shades that were wearable for me until this - it’s such a perfect shimmery champagne and something I’ll use on the daily. A foundation stick is something I’ve wanted to try and seeing L’Oréal bring one out integers me. Drugstore prices and L’Oréal’s foundations have always worked in my favour why would I want to try this?? I love my makeup looking glowy and seeing Charlotte tilbury bring this out caught my eye. Nothing is better than a product that helps you get glowy skin, it just looks so much better than being matte sometimes! I like the wonderglow primer so if it’s anything like that I’ll love it! I’ve heard nothing but good things about the urban decay all nighter concealer and I really want to try it. I rarely try new concealers but this has caught my eye with that coverage & lasting power. Not to mention the cute packaging! They still are beauty but mainly skincare - the 2 masks! Both of them are something completely new to the beauty / skincare industry with the gorgeous glitter in them & amazing packaging! I need these in my life but with the price I doubt it’ll be happening anytime soon. I can’t be the only one lusting over these products? The makeup world is being hit by a storm of amazing products at the moment and all I wanna do is buy them!